Born and raised in the New York City area, Tom is the beneficiary of almost 16 years of Catholic education. He received his B.A. in Business Administration from Marist College, Poughkeepsie, N.Y. and after a tour of duty in the U.S. Army, completed his MBA in Finance from Hofstra University. Tom has over 30 years experience in banking. He started in commercial banking in New York and moved west through Texas and Colorado, finally arriving in Los Angeles over 25 years ago. Tom is presently employed by the Private Banking Group at Wells Fargo. 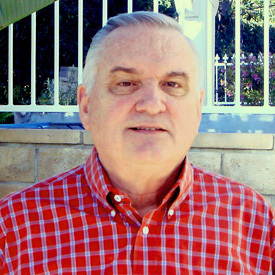 Tom and his wife, Ann, reside in Woodland Hills and are members of St. Mel's Parish. Tom also serves on the Board of Project New Hope, an affordable housing provider. I was introduced to the Foundation's Board by Alvin Lamarre, who had taught and coached three of our four sons while they attended Crespi Carmelite High School. As a strong believer in Catholic education, as well as the benefits of extracurricular involvement, the Mission Statement of the Lucille Rader Educational Foundation resonated with me. I feel the Lucille Rader story is one that has significant relevance in our church today as members recognize the needs of the community and take over leadership from our ordained leaders. I am honored to serve on this Board and look forward to furthering its goals and objectives.